We are pleased to offer Science International Scholarships 2017 to all international undergraduate students starting their studies in the Faculty of Science in September 2017. - You must hold an offer of a study place and begin your undergraduate studies in September 2017 in in one of the following departments: Animal and Plant Sciences, Biomedical Science, Chemistry, Mathematics and Statistics, Molecular Biology and Biotechnology, Physics and Astronomy, Psychology. 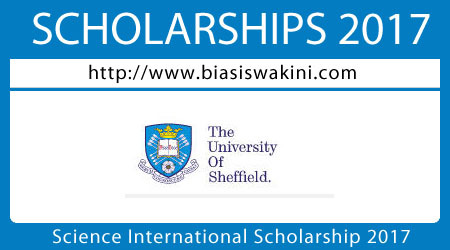 - The scholarships will be awarded unconditionally in the first year of study. You can also receive this in each subsequent year of study, subject to achieving 60% or above in the previous academic year. This excludes any years in industry or study abroad periods. 0 Komentar untuk "Science International Scholarship 2017"